Let’s say that thanks to your MAGI, you do make too much to contribute to a Roth IRA directly. That means that your MAGI will also prevent you from deducting contributions to a traditional IRA, since the income limits are the same. Even so, no matter what your income level is you’ll always be able to contribute to a traditional IRA. You just may not be able to deduct those contributions. Also note that when you make non-deductible contributions to a traditional IRA, you establish a cost basis in that contribution. This is important for the tax treatment of your account in the future. (And essential for the backdoor conversion to work). In other words, the amount of the contribution you’re paying income tax on will be your basis in the account. Let’s look at this from another angle. Let’s say you make a $5,500 contribution to a traditional IRA. You file as a single person and your modified adjusted gross income is $75,000 for the year. You deduct the $5,500 contribution on your tax return. Then you leave it alone, and it grows to $20,000 by the time you’re 65. When you take withdrawals from the account, you’ll owe income tax on the difference between your withdrawal and your basis in the account: $20,000 – $0 = $20,000. But if instead you didn’t deduct your initial contribution to the account, you’d have a basis in the account of $5,500. Withdrawing later on when the account is worth $20,000 would add $20,000 – $5,500 = $14,500 to taxable income. You’re only taxed on the gains, above your cost basis. Even if your MAGI prevents you from deducting contributions to your IRA, you’ll need to help the IRS keep track of your basis. This can be done by filing form 8606 with your taxes in the years you make non-deductible contributions. Failing to file form 8606 may mean the IRS will try to tax you twice on your contributions. You can file this form retroactively if you need to, though. The next step is to convert your contribution to a Roth IRA. The tax code allows us to convert assets in our traditional IRAs to Roth IRAs whenever see fit. They are considered taxable events though, which is why the use of non-deductible contributions is essential. When converting funds in a traditional IRA to a Roth IRA, the difference between the market value of the amount converted and your basis is added to your taxable income on the year. But since you established a basis by making a non-deductible contribution in the first place, the amount added to your income tax would be: $5,500 – $5,500 = $0. Thus, even though your modified adjusted gross income is too high to contribute to a Roth IRA directly, you can still get in through the backdoor. Logistically you’ll obviously need both a traditional and Roth IRA opened at the brokerage firm holding your accounts. Most brokerage firms are familiar with the strategy, and can help you shuffle funds into your traditional IRA and then over to your Roth IRA. Beware though that brokerage firms are not in the business of giving tax advice (just read a few lines of ANY of their disclosures). They’ll certainly be able to help with the logistics, but will probably not be an expert on the potential pitfalls. I’ll cover the finer points below, but I normally suggest that anyone interested in this strategy do so with the guidance of an adviser/financial planner. Using this strategy hastily could put you at risk of penalty. The step transaction doctrine is the legal principal that a series of related steps are treated as one individual transaction. In other words, even though the internal revenue code allows each individual step in a backdoor Roth IRA conversion, the sum of the steps could be interpreted by the IRS as a direct contribution to a Roth IRA. And since this is disallowed in the first place, the IRS could force you to unwind the transaction. Their argument, founded in case law, would be that your intent was to circumvent the rule in the first place. On top of disallowing the transaction, the IRS could also impose a 6% penalty for excess contributions to your Roth IRA. And keep in mind here that the 6% penalty is not a one time thing. It’s imposed for every year that the excess contribution isn’t corrected. That means that if you execute a backdoor conversion every year, a 6% penalty could compound year after year after year. To avoid the step transaction doctrine, backdoor Roth conversions should be executed over a period of several years. Remember – the doctrine is imposed when it’s determined your intent is to contribute directly to a Roth IRA. That means that funding your traditional IRA with non-deductible contributions, then executing the conversion the following day puts you at risk. Allowing your traditional IRA contributions to grow & fluctuate over time with market swings helps establish each step as a separate transaction. In other words, let your contributions age before finishing the conversion. So how long should you wait before converting? I’d suggest two tax reporting cycles. That means if you contribute to a traditional IRA on December 31st of year 1, wait until year 3 (after you file your taxes) to finish the conversion. This waiting period has been the subject of a lot of debate over the last few years, though. Ed Slott is steadfast in his recommendation to only wait one month. Others, like Michael Kitces, think a year is fine. The IRS has been quoted as saying “there’s no caveat in waiting” when it comes to the step transaction doctrine for backdoor Roth conversions. But as Kitces points out, IRS enforcement is only part of the equation. While your decision to wait may help you avoid initial scrutiny, if you do wind up in trouble your argument will be in front of a tax court, not an IRS agent. And even though the guidance from IRS representatives is helpful, they cannot forecast how a tax court may interpret the situation. 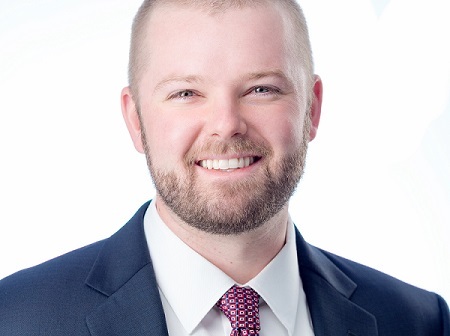 Putting your contributions “at risk” for a longer period of time can only strengthen your case that a contribution and conversion were separate transactions. Ultimately, I’ve not heard of a case where the IRS has scrutinized backdoor Roth conversions. Nevertheless, there’s no reason to take the risk. A $5,500 contribution growing at 10% per year would become $6,655 after two years. By playing it safe you’d only be adding $6,655 – $5,500 = $1,155 to your taxable income. The second pitfall that often thwarts would-be backdoor Roth converters is the concept of IRA aggregation. According to IRC rule 408(d)(2), when determining the tax consequences of a distribution you must treat all your IRAs as one aggregated account. This means that if you have several other IRAs, you won’t be able to “carve them out” of the tax calculation for a backdoor Roth conversion. This can become a big issue if you have pretax assets in IRAs already. Let’s say that you have $100,000 in an IRA, resulting from a rollover of a 401(k) from an old employer. Since you deducted your contributions to the old 401(k), you have a cost basis of $0 in your IRA. 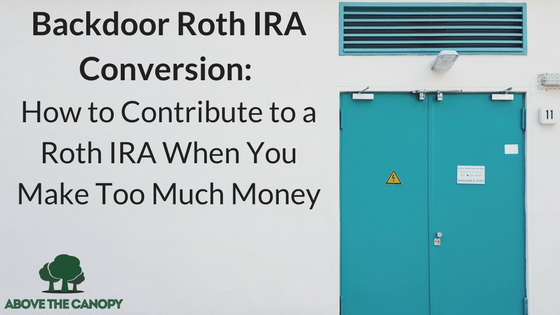 If you wanted to execute a backdoor Roth conversion, you’d contribute $5,500 to an IRA. The contribution could be into the same IRA or another – it doesn’t matter. Thanks to the pro-rata rule, you’ll need to include both balances when performing the conversion. That means that your total balance across all IRAs is now $105,500. And since you only paid tax on the most recent contribution, your basis is $5,500. It also means that when executing the conversion, you’d need to use the ratio of total basis to total market value, across all your IRAs: $5,500 / $105,500 = 5.21%. Consequently, any Roth IRA conversion would include 5.21% in after tax funds, and the rest in pre-tax funds. If you converted $5,500, $286.55 would be tax free, and the remaining $5,213.45 would be added to your tax bill for the year. In other words, having preexisting pretax assets in IRAs dilutes the value of the backdoor conversion. There is a workaround though, though, if you have access to a workplace 401(k) plan. Many plans allow you roll assets in from an external IRA. Doing so here would enable you remove your pre-tax funds from the equation. (Keep in mind, though, that the funds you roll into a 401(k) may be locked there until you separate from service. Depending on the plan, of course). All in all, I’m a big enough fan of Roth IRAs that I think most people in the accumulation phase should at least consider the strategy. Especially you believe that tax rates will need to increase to afford our country’s spending in the long run (which I do). So what do you think? Have you executed a backdoor Roth conversion in the past? Would you do so in the future? Posted in Financial Planning, Investing, Retirement, Taxes & Accounting and tagged back door Roth conversion, back door Roth IRA conversion, backdoor roth, backdoor Roth conversion, backdoor roth ira, backdoor Roth IRA conversion, how to backdoor roth ira, roth backdoor, roth ira backdoor.